‘Heavy Metal Parking Lot’ It’s 25 years since Jeff Krulik and John Heyn walked around the Capital Center’s parking lot in Maryland, interviewing boozed up rockers before a Judas Priest gig. The resulting document has become required viewing on tour buses across the globe, and now you can enjoy the clothes, the hair and the language in all their glory – in the Light House’s courtyard. This event is sponsored by The Kraken Rum and free rum cocktails will be available and best of all the event is FREE too from 8 – 11pm. and for the full Home of Metal season see HERE. 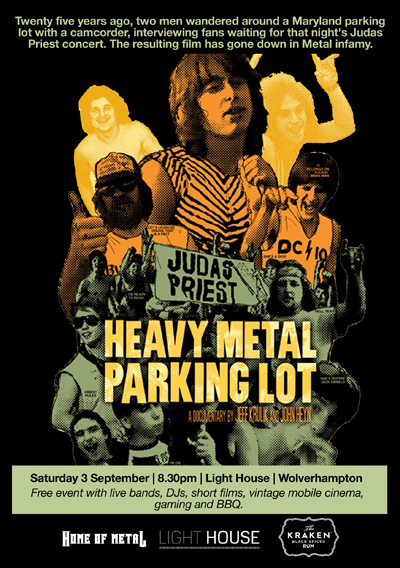 Be warned last time we showed Heavy Metal Parking at Capsule & cake way back in 2002 we had the most legendary & messy party, prepare for one mighty hangover.